Extend the life of your work boots. 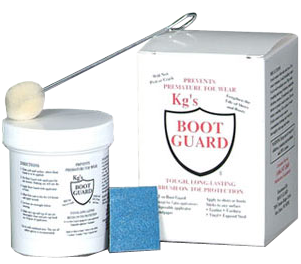 Kg's Boot Guard offers superior toe protection for work boots. Use it around the welts and seams to keep out water and protect your boots from damage. Easily applied to new or used boots. Kg's Boot Guard offers toe protection for work boots that can be found in over 1100 stores across the nation. You can also learn how to become a distributor of Kg's Boot Guard and start offering your customers premiere work boot protection. and durability of their laces! Great for restoring the natural beauty of leather boots, gloves, saddles, and jackets, Kg's Leather Guard offers superior protection from water, scuffing, spotting, salt, and much more!